PAMP Suisse Gold – What Lies Behind the Value? Why is PAMP Suisse gold considered so valuable and preferred by investors around the globe? There are a number of reasons that these bullion bars are so highly regarded by investors and collectors alike. The PAMP in PAMP Suisse gold stands for Produits Artistiques Mataux Precieux, and this is the name of the refinery where the gold is refined. This refinery is located in Switzerland, in Castel San Pietro, known as one of the finest gold refineries anywhere in the world. This bullion is similar to Credit Suisse gold bullion, because both them are backed by companies with a long and solid history of producing only the finest precious metals possible. PAMP Suisse gold bullion is composed of 24 karat metal purity, with its exact weight and purity specifications stamped on its surface, virtually eliminating any guesswork about what type of bullion bar you are holding in your hands. This is also true when you choose the Credit Suisse gold bar, because both of these manufacturers are known for their rigid quality standards and weight guarantees. This lets investors know that choosing PAMP Suisse products means getting great quality and a known quantity with no risks. A big part of the value of this investment product is the trust that investors have in the PAMP name and quality standards. With the gold bullion market at astronomical highs, fake gold bullion products on the market can be a big concern. 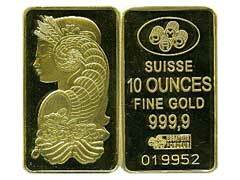 When you buy gold bullion bars, you want to get the metal content and quality that you are paying for. With many producers you may have to do numerous tests, and pay for third party verification and assays. With PAMP Suisse gold, an assay is done right after the product is created, and the gold purity and weight are stamped onto individual bars. This lets investors know they are getting the real thing, at the finest possible purity. Botoom line, these bullion bars are backed up by one of the most well known banks in the world, Swiss National Bank, made out of the highest purity metal and carry some of the highest liquidity among similar products.